It’s an annual event that is much anticipated and applauded among SF watchers of all things home design—the Decorator Showcase, for 2017. This year’s showcase was staged in Pacific Heights at a Classical Revival mansion parked at 2698 Pacific Avenue. Last year’s was up on Telegraph Hill at the Villa de Martini. Last year’s Showcase was a pyrotechnic explosion of color and contemporary form. This year’s went for darker but more subdued palettes while filling out rooms with classical or modern stylings. 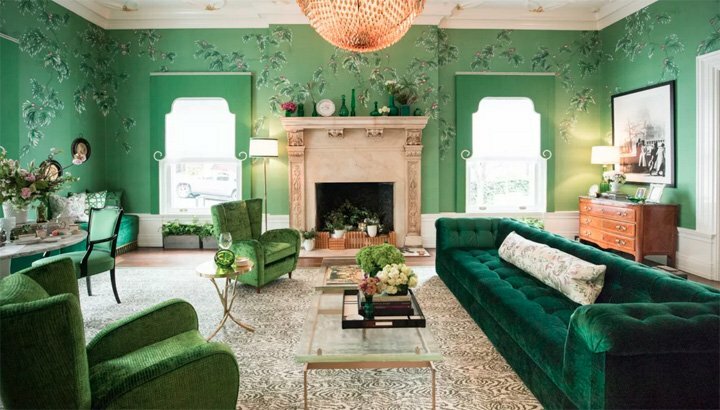 Among the featured designers are Jonathan Rachman, Elan Evans, Beth Martin, Jaimie Belew, Diane Rosenblum, Kristen Pena, and Dina Bandman, and others (see full article link below). The results are stunning improv in both old world style and especially in the contemporary looks brought to bedrooms or even the Zen treatment of the penthouse living room and bar. Many touches include hand tooled items, like origami birds or drapery cut and wrapped round a chandelier. A curio closet is made coppery magical from designer Krista Hoffman. Read the full article at SF.Curbed.com.